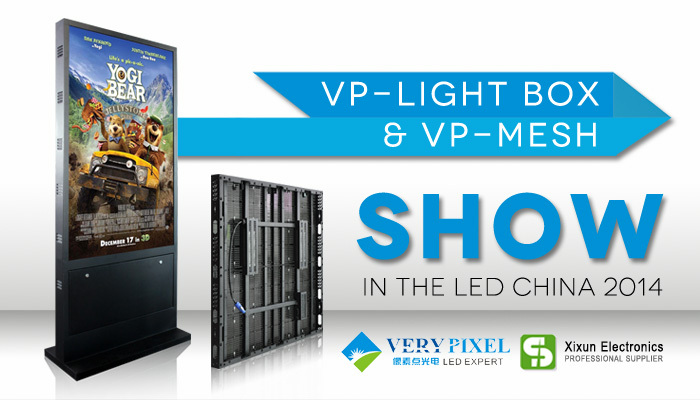 verypixel led china 2014 - Shenzhen Verypixel Optoelectronics Co., Ltd.
● Verypixel will attend the 10th LED China 2014 fair in Guangzhou from 23th to 26th, February 2014. ● Verypixel is not a big fan of business fairs, but this time, LED controller partner XIXUN will attend this fair, and they highly suggest us cooperate with them to join this fair. So we will show some brilliant products. ● On this Fair, Verypixel will bring its best selling product—VP-Smartile series, and VP-MESH-I10. And our booth number is: 10.2-E51. ● LED China 2014 is the biggest fair for led industry event every year, with 5 zones, 8 halls, total 80,000 M2, there will be 1200 enterprises,90,000 visitors visit this fair. Verypixel people is expecting you attend this fair and warmly welcome you visit our booth at: 10.2- E51.